Relive the classic Walt Disney movie Sleeping Beauty and bring home this unique Thomas Kinkade collectible! Thomas Kinkade, the Painter of Light, emphasized simple pleasures and inspirational messages through his art. 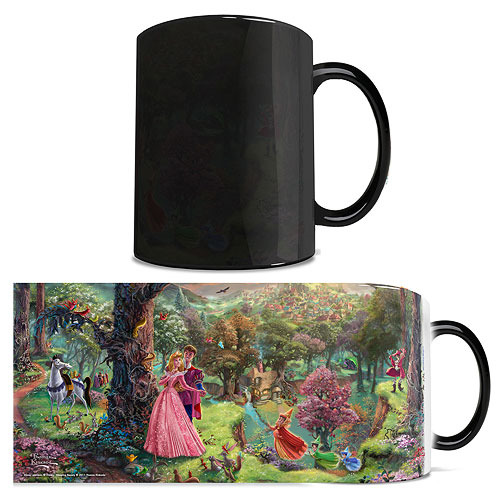 The Disney Sleeping Beauty Thomas Kinkade Studios Morphing Mug transforms from black as hot liquid is added! Watch as the heat-activated process reveals the hidden image in full vivid colors! Holds 11 ounces. Do not microwave. Hand wash only. Not dishwasher safe. Ages 12 and up.